‘Rather than being an easy option, Pilates has always been about building strength. 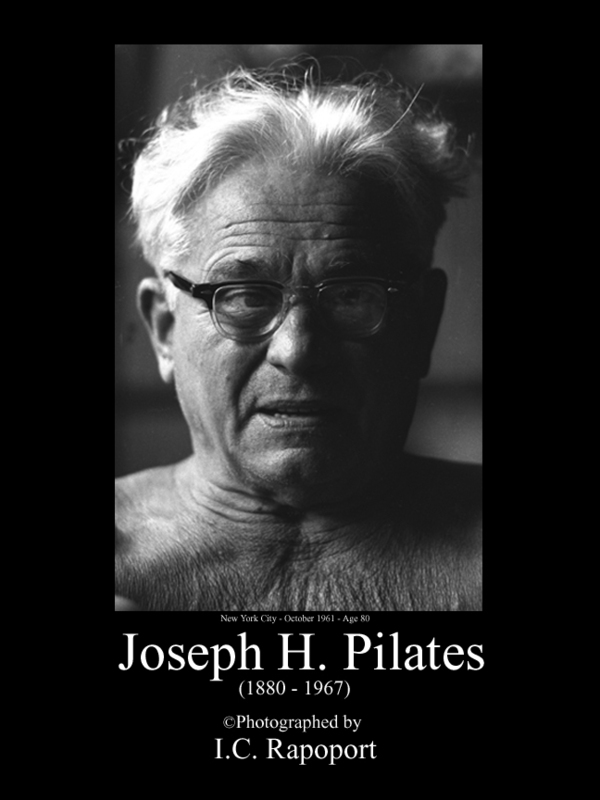 Joseph Pilates had a background in self-defence and boxing and opened his “body-conditioning gym” in New York in 1926 to teach people how to achieve strength through better body control. 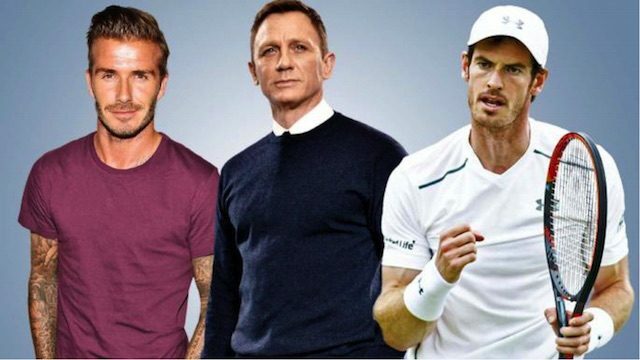 Elite athletes have long loved it — David Beckham, Andy Murray and Tiger Woods are fans. Give us a call or pop into the studio to find out all the benefits of Pilates for men. Read the full article on The Times website (if you’re not a member you’ll have to register, for free). Roughly one in eight British women will develop breast cancer. Pilates can do a lot to help those diagnosed with breast cancer to start regaining their physical confidence, rebuilding their self-esteem and heading down the road to recovery of the body, mind and spirit. One of the many things that can get neglected during and after treatment for breast cancer is exercise. After a breast cancer diagnosis and the invasive treatments – from surgery to radiation and chemotherapy – that tend to follow, many women are left feeling somewhat detached from their bodies. Pilates can help mend this separation between the mind and body since it makes patients “think” through their movements and focus on the quality of the movement. Some women with breast cancer experience impaired movement of their shoulder(s) following surgery, such as a mastectomy. Pilates can help slowly increase their range of motion by encouraging and teaching good shoulder-blade alignment while at rest and then incorporating gentle movements from this stable base. An academic study on the effects of Pilates on the shoulder and “upper-extremity” mobility among women living with breast cancer, published in the journal Physical Therapy in 2008, found that Pilates can indeed improve the mobility of such women. Following surgery for breast cancer, many patients might notice a change in their posture and see a rounding of the upper back as well as some slumping in their shoulders. Since Pilates focuses on posture and alignment, patients can use it to teach their body how to resume a more erect posture and maintain that posture through further back exercises. The emphasis in Pilates on focusing on the feel of the movement rather than on its appearance can also help build the self-esteem of those who are trying to get back into a routine and to stop worrying about how they look after a mastectomy or other invasive surgery. A good Pilates instructor can design an individually based program that will progress and evolve as a breast cancer patient starts to regain strength. As always, it is advisable to ask a doctor before starting any new exercise program. 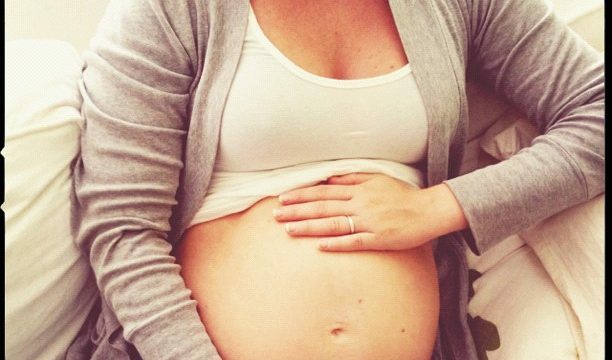 We’re often asked if you can do Pilates when pregnant. Many women first discover Pilates and become practitioners here either when they are pregnant or have just given birth. The studio doesn’t offer separate classes for either pregnant women or new mothers. What we do instead is something much better and more tailored, which is to design a specific Pilates programme to meet the precise, individual needs of each woman. You may need to do Pilates in a modified or gentler way while pregnant and to make sure you stop the moment that you feel any discomfort. A properly tailored Pilates programme, however, can be the ideal way to lessen or avoid the back-pain commonly experienced during late pregnancy and then to enable your body to regain its shape rapidly after birth. Please visit our Pilates and Pregnancy page for more on antenatal and Postnatal Pilates. The page includes the Benefits of Pilates for Pregnancy, a handy table of the stages of pregnancy where Pilates can be performed. Also included is an FAQ. If you have any questions regarding your pregnancy and Pilates please see our contact page. We are privileged enough at Pilates Central to have a permanent exhibition of rare photographs of Joseph Pilates at work in his New York studio in 1961. They were taken by the acclaimed photographer I.C. Rapoport and signed by the latter after his praised talk at Pilates Central in 2005. Read a longer article about the History and Origins of Pilates on our website by clicking here. She came to it as a reluctant, 18 year-old ballet-dancer. “He had white hair. He has a very tanned, muscular body. In boxing, he lost an eye. He had all the muscles of a fencer. “He had a studio on 8th avenue, on the second floor and it was not very big and kind of dirty. “He was introduced to me and I thought he was a crazy old man. I couldn’t understand why Mr Balanchine wanted me to go. I.C. Rapoport is a renowned photojournalist and screenwriter. He photographed everyone from Samuel Beckett and Fidel Castro to President JF Kennedy. In 1961, I.C. 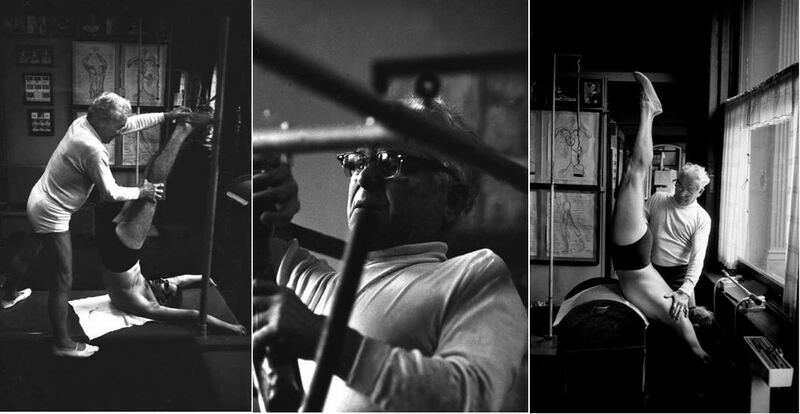 Rapoport was fortunate enough to photograph Joseph Pilates in his New York “gymnasium”. Pilates Central and the wider world of Pilates are lucky to have this rare glimpse of Joseph Pilates at work in his own studio. Those interested in buying signed prints of I.C. 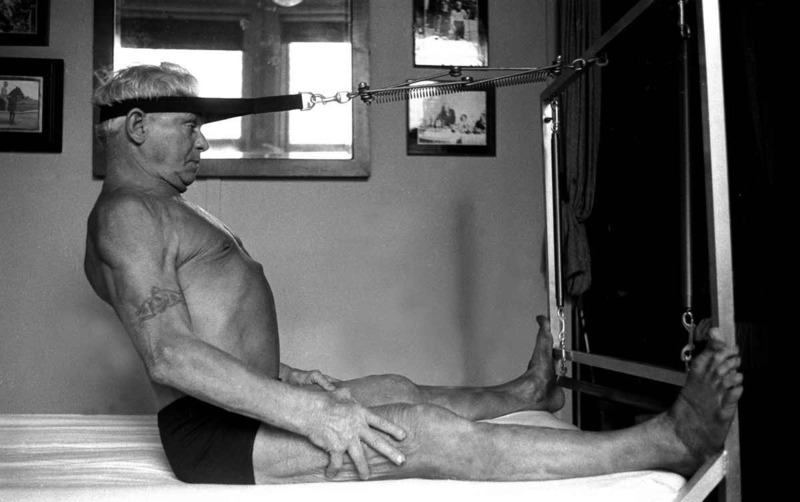 Rapoport’s photographs of Joseph Pilates should let us and know – and we can make arrangements with I.C. Rapoport for you to purchase them. Many people think of Pilates as something mainly done by women. But around a third of our clients at Pilates Central are male and some days the studio contains as many men as women. What is true, however, is that men and women often start doing Pilates for different reasons. Increasingly, Pilates is appealing to all types of men – from dentists or taxi drivers with back problems, to film stars who need to look good and move well. When preparing to play James Bond, actor Daniel Craig took up Pilates in earnest. Another fan is Hugh Grant, who quips, “Now I have muscles of steel and could easily deal with giving birth”. 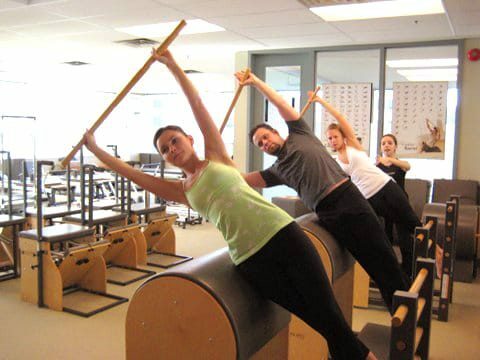 Pilates can also aid athletes recovering from injury, or wanting to prevent it. Footballers Ryan Giggs and Jonathan Woodgate, cricketers Andrew Flintoff, Ryan Sidebottom and Shane Watson, golfer Seve Ballesteros have all used Pilates to strengthen their core muscles. Pilates teachers have their own routines for making male clients feel at home. Julian Littleford, owner of a Pilates studio in San Diego, says: ‘You have to open a man’s eyes to the depth and importance of the work and allow him to experience everything it can do”. Give us a call for a no obligation chat about how you can benefit from a tailored programme of Pilates sessions in Islington N1. Pilates can alleviate many of the symptoms of the menopause. Menopausal women often experience a sense of loss, for both their youth and their child-bearing ability. But exercise and a positive attitude can help assuage such a feeling and many the symptoms of the menopause, including hot flushes, mood swings, depression, irritability and sleeplessness. Stretching and breathing exercises can calm and relax menopausal women and help them sleep better. Weight gain can be countered through instructors giving more intensive exercises to menopausal women. These can help with weight gain around the hips, buttocks and thighs, another result of the menopause. Exercise also releases endorphins, the body’s feel-good chemicals that counter depression. Skin strength and elasticity can also be improved through Pilates. 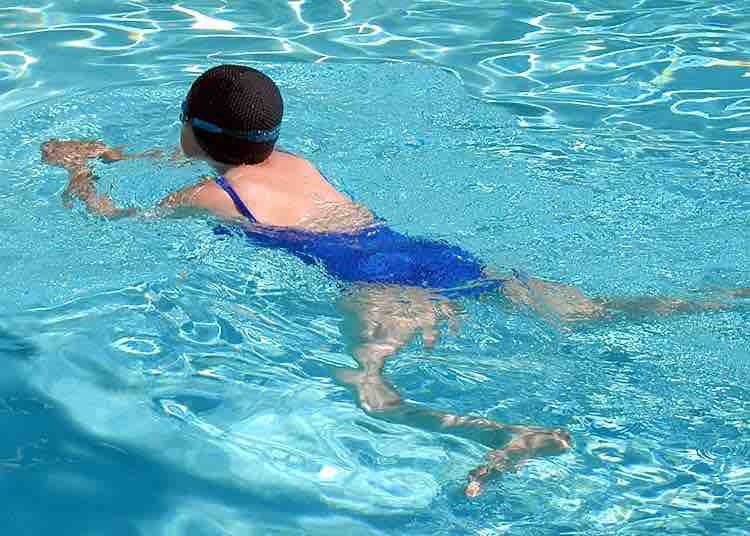 Exercise has been shown stimulate collagen regeneration in the muscles and bones. This is extra benefit for menopausal women, some of whom are at risk of osteoporosis. The menopause is a time of great change, but Pilates can result in more energy and confidence, less stress and a drop in hot flushes, fatigue and other related symptoms. Women also appreciate the social aspect of Pilates and the support and humour of women at a similar life stage. “Pilates is a mind-body experience just like menopause is, and we can use the philosophy of Pilates to help women through it”, comments Carolyne Anthony, a Pilates expert and director of The Center for Women’s Fitness in Ann Arbor, Michigan. Give us a call for a no obligation chat about how you can benefit from a tailored programme of Pilates sessions. “I can honestly say that Pilates has tripled my energy level”, states Sian Phillips, the distinguished actor, who also happens to be a longstanding client of Pilates Central. Doing Pilates, says Joan Bakewell, the writer and broadcaster, leaves her with “a tremendous sense of well-being”. They are not the only ones. Others find that Pilates leaves them feeling both relaxed and energised. One of the reasons is simply that every time you exercise, your body releases endorphins, the natural ‘feel-good’ hormones. But there’s also more to it than that. The breathing exercises integral to Pilates promote good circulation, improve lung capacity and improve your all-round energy levels. Deep breathing increases the oxygen in your blood, helping to invigorate the mind, brain and body and help you forget day-to-day cares. A more relaxed person is a less stressed one, which tends also to mean a more energised one. The effect also lasts long after a Pilates session has ended, since Pilates strengthens the abdominal muscles and speeds up your metabolism by replacing fat with muscle. Pilates can improve your general health through finding a “neutral” position for your pelvis, spine and rib-cage, strengthening your core abdominal muscles and stabilising and mobilising your shoulders and neck. All of these benefits should help leave you with a feeling of more energy.